A preview performance of 'Invisible River' was held Friday, June 12, 2015, at Lemon Hill. Philadelphia officials are continuing an initiative to provide funding for local artists and organizations to deliver cultural performances in the city's public spaces. The Office of Arts, Culture and the Creative Economy (OACCE) announced Monday that it is now accepting applications from those interested in performing during the upcoming year. Anyone wishing to receive a grant must be willing to perform for free at a city-owned facility or area. Now in its third year, the Performances in Public Spaces grants are designed to engage city residents with high-quality cultural experiences. 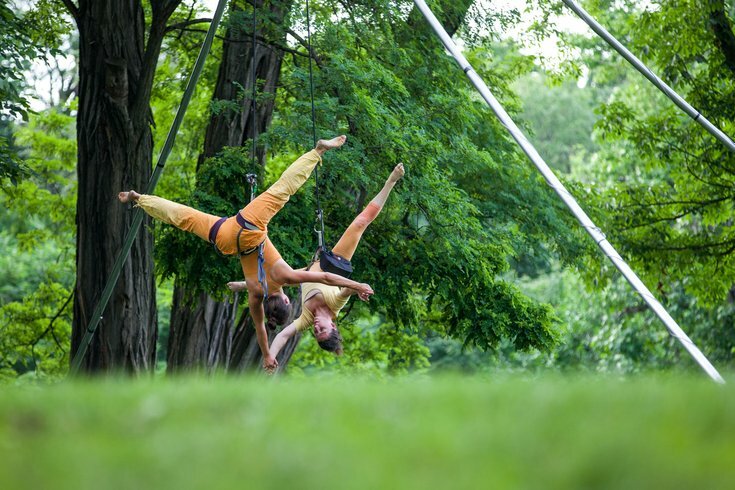 Past performances included flamenco dancing, Shakespeare in the Park, a pop-up circus theater and aerial dancing (seen above) on the Schuylkill River and East Fairmount Park. The program is expanding this year through a partnership with the Wawa Welcome America Fourth of July celebration. The OACCE will present an afternoon of performances on July 1 as part of the 25th anniversary of the event. The city offers more than 40 diverse sites for performances, including neighborhood parks, historic homes in Fairmount Park, Penn's Landing and more. To apply, performers must go to the OACCE website and submit previous work samples, a short description of the proposed activity and a budget. The deadline is March 27. City officials expect to reveal the winners of the grants in June.